Customers have more ways to interact with businesses than ever before. Connect with your customers through multiple channels, all while centralizing information that empowers your sales team to have contextual, meaningful conversations with your prospects—all through Zoho CRM. Bring customer emails from your inbox into Zoho CRM. See the full history of correspondence between you and your contacts. With fine-grained privacy and security permissions, managers of a sales team can view all communication that's taken place between their team and customers. 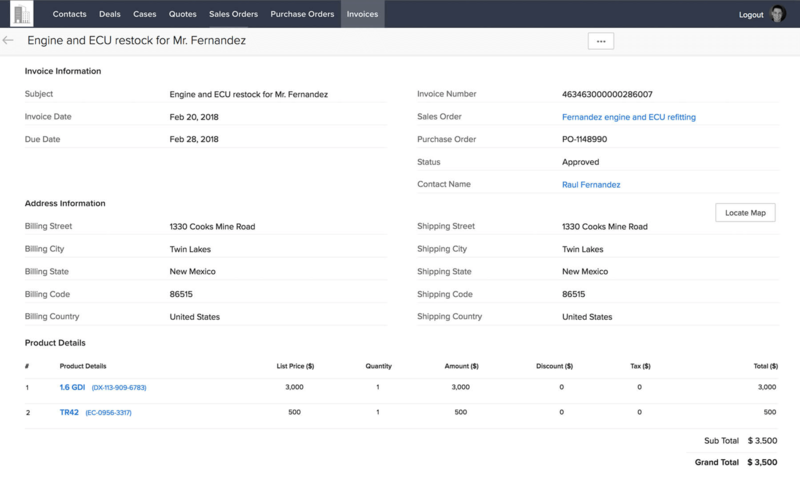 Detailed reports on viewer stats, and analytics for emails and templates, help create better interactions with customers. And for the ultimate experience, check out Zoho SalesInbox, the only email client built exclusively for salespeople. Don't just make calls, have conversations that matter. Zoho CRM has all the information you need to be prepared for your next call. Our Phonebridge integration means you can start calls and view customer information all in the same place. Take notes to help remember conversations and set reminders to follow up with customers. You can also view any calls you missed while you were away. 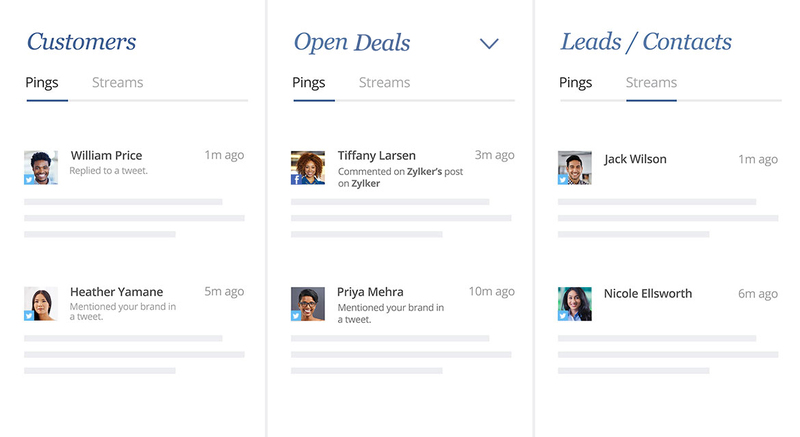 Manage all your conversations across Facebook, Twitter, and Google+. Respond in real time to posts from your prospects and leads, as they happen. Move from sharing content to having conversations to closing deals, right from the Social tab. Foster relationships with contextual live chat. Find out whether your website visitors are new or existing customers before you even start a chat. 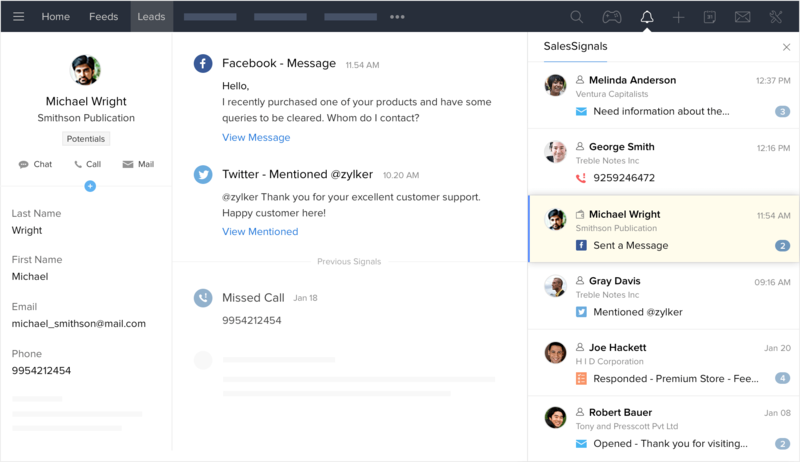 Access the chat history of your leads, contacts, and customers from within CRM. Convert your live chats into leads, add deals, and create follow-up tasks all from your chat window. Channel the power of collaborative selling. Provide greater visibility for your customers, vendors, and partners through distinct portals. Let them access their relevant records, cases, purchase orders, and invoices so they can make better-informed business decisions. Stay on top of all your interactions, in real time. Never lose track of customer interactions again. SalesSignals is at the crux of Zoho CRM's multichannel communication. From opening emails, to mentioning your brand on social media, to activities from third-party integrations, SalesSignals brings your notifications from across Zoho CRM into an organized timeline, in real time.